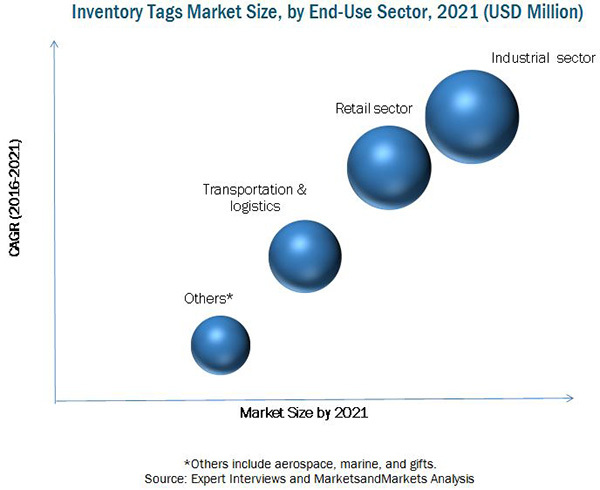 [237 Pages Report] The inventory tags market size is projected to grow from USD 4.08 Billion in 2016, to reach USD 5.07 Billion by 2021, at a CAGR of 4.43%. The segments considered for this report are based on printing technology, label type, technology, end-use sector, and region. The segmentation based on technology consists of barcodes, RFID, and others. Label types include plastic labels, paper labels, metal labels, and others. The end-use sectors include the industrial, retail, and logistics & transportation sectors. On the basis of region, the report is segmented into North America, Europe, Asia-Pacific, and the Rest of the World (RoW). The base year considered for the study is 2015 and the market size is projected from 2016 to 2021. Factors such as increasing protection against theft, loss, and counterfeiting; scope for technology integration; identification of products without human intervention or need of line-of-sight; and adoptions of real time tracking systems have propelled the growth of the global inventory tags market. The inventory tags ecosystem comprises of inventory tags manufacturers and vendors such Avery Dennison Corporation (U.S.), Tyco International plc (Ireland), 3M Company (U.S.), Brady Corporation (U.S.), and government and national associations such as IMDA, which helps the manufacturers in the development and growth of inventory tags products, technologies, and markets. MarketsandMarkets projects that the inventory tags market size is expected to grow from USD 4.08 Billion in 2016 to reach USD 5.07 Billion by 2021, at an estimated CAGR of 4.43%. The implementation of inventory tags technologies is an important strategy taken up by many manufacturing companies and regulatory bodies in recent years. Increasing awareness toward protection against theft, loss, and counterfeiting; scope for technology integration; identification of products without human intervention or need of line-of-sight; and adoptions of real time tracking systems are some of the factors that contribute to the growth in the demand for inventory tags in packaging. Additionally, strict laws pertaining to counterfeiting activities, need for efficient use of supply chain, and availability of cost-efficient counterfeiting technologies have propelled packaging companies to opt for inventory tags technologies, which enabled cost savings. In order to protect the product from counterfeiters, companies accommodate authentication technologies in their product packaging. Authentication technologies such as barcodes, RFIDs, and security inks & dyes are used by companies to protect their brand image. The use of authentication technologies in the industrial sector is projected to grow at the highest CAGR during the forecast period. The segments considered for this report are based on technology, label type, printing technology, end-use sector, and region. The segmentation based on technology consists of barcodes, RFID, and others (QR codes and normal tags). The RFID technologies segment is a huge market which is projected to grow at a high growth rate from 2016 to 2021. RFID technologies include readers, and software services and are used extensively in the packaging industry. With the help of readers, products can be traced in seconds; this helps to improve and track the supply chain process from production through distribution and retailing. The RFID technology segment is growing tremendously and is opted for by many industries as it reduces manual costs and improves visibility and planning. Asia-Pacific is projected to be the fastest-growing region in the inventory tags market during the forecast period; the rising population of the region, along with high disposable income and the demand for packaged food products are factors driving the growth of the inventory tags market. China is projected to be the fastest-growing country in the inventory tag market from 2016 to 2021. The major drivers for the growth of the inventory tags markets in the this country include strong government support, efforts towards standardization, expanding application segments, convergence of technologies, and rising awareness of using inventory tracking technologies. Zebra Technologies Corporation (U.S.) has maintained its leadership position through its strong distribution network across Asia Pacific, Europe, and the Americas. Zebra Technologies Corporation has strengthened its position as a leading provider of visibility solutions across the world. The company has adopted mergers and acquisitions as its key strategies to capture the market. In October 2014, Zebra Technologies Corporation acquired the enterprise business of Motorola Solutions, Inc. (U.S.) which strengthened Zebra’s product portfolio, geographic reach, go-to-market channels, and industries served. The company plans to enter into new and emerging markets given its stable financial position and a strong customer base. 10.3.3.1 Barcode Segment Projected to Dominate the Market During the Forecast Period. 10.4.3.1 Barcode Segment Projected to Dominate the Market During the Forecast Period. 10.4.9.1 The Plastic Labels Segment is Projected to Grow at the Highest CAGR During the Forecast Period.